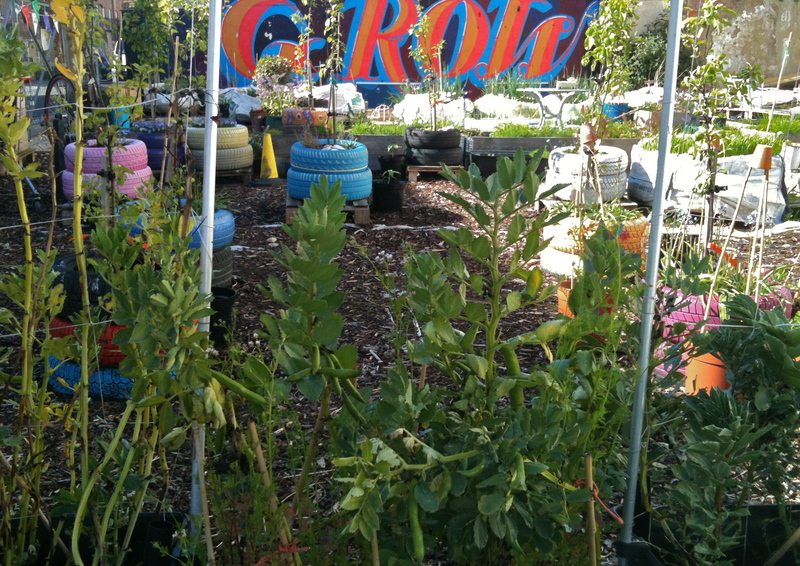 The Moveable Feast Garden is a community growing space in St Leonards. Set up in June 2012 by local residents it exists as a space for the St Leonards’ community to use as a shared urban allotment. It is open to anyone who are interested in growing seasonal produce, learning new skills in cooking and food production, organising events and sharing the harvest. We were founder members of the local Wonky W.I. which was set up in Autumn 2011 with “a less jam, more campaigning agenda.” So, when we heard that we could apply for grant money from the W.I. 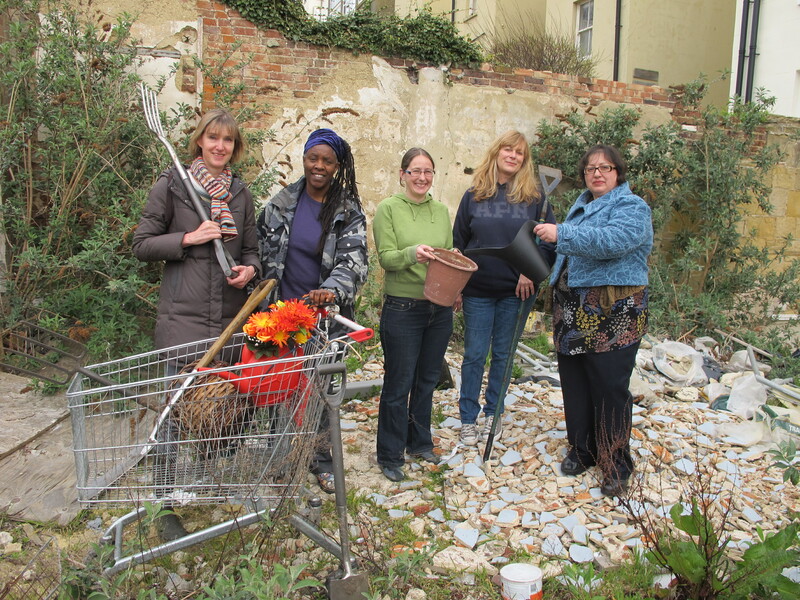 National Federation to improve a local space we quickly formed a Gardening Group and began to cook up a plan. St Leonards on Sea has character and characters aplenty. We have the glorious seaside, sunshine and fresh air but not everything in our garden is rosy. In fact for many people here who live in bedsits or flats there is no garden at all and this is what we hope to change in 2012. Our dream is to convert a derelict site in the middle of town into a community produce garden where local people can meet their neighbours and help one another grow fruit and vegetables. We envision this as a most inclusive project where everyone will feel welcome to contribute and share their time, energy and skills. We looked for a visible site in the centre of town and behind some battered hoardings we found a potential paradise. A large south–facing, derelict plot owned by local developers Roost. They have planning permission but no project start date as they await an upturn in the economy. We approached them with our idea and they liked it, but it would have to be temporary – a year or two at most. This problem soon became our USP. As we were starting from scratch why not construct a totally portable garden? A container garden with a difference – a moveable feast that could be picked up and put down on another derelict site when the time came to hand back the land. So that became our plan. Incredible Edible in Todmorden http://www.incredible-edible-todmorden.co.uk inspired us, as did garden by the side of the tracks at London Bridge http://www.youtube.com/watch?v=-kTx3gHmnG0&feature=related and a community garden in Newham, South London where everything is grown in builders’ bags. We started work on the site in May with site clearance help from Hastings Council’s contractors. Local businesses donated everything from fantastic secure fencing to gravel, compost and fruit trees. The local press publicized our efforts and our first work day on June 16th saw 20 people turn up to shovel and shift gravel, fill bags with compost and start laying out the garden. We opened at the end of June and the garden flourished that summer despite the downpours. In Autumn we contracted a horticulturist to help us for 6 months and bought a polytunnel with the W.I. grant money. This winning combination meant we were able to start our growing year early, despite the coldest Spring in living memory. Flowers bloom, herbs and vegetables grow and best of all people visit, spend time and enjoy simply being outdoors together. The Moveable Feast Garden is no longer associated with the W.I. but will always be grateful to them for giving us the idea and the opportunity to start this wonderful garden. One day we may have to move on and we’ll cross that bridge when we come to it…. Id love to be involved in this. I live round the corner in a 4th floor flat in warrior gardens but have no garden now and miss it hugely. I’ve always had a garden and have quite a bit of experience so wondered if I could help out? Of course you must get involved. We will be clearing on 1st May so after that it will be all action. You guys are bloody fantastic! How brilliant…WELL DONE! Thanks! We really want everyone to feel part of this and need help with spreading the word to the local community as there are not many of us – please do talk to people about the garden and tell them to get in touch with us for more information. You wonderful people… I wish I lived close enough to help you! Just to let you know that I have nominated you for a ‘One Lovely blog’ Award… keep up the good work at your site! This looks great – why did I not know about it! Hope to come along very soon. Well done. Sorry if its taken a while to respond. To be honest we have more than our fair share of tools but if you would like to donate them we will makes sure they go to a good home. Thanks very much for thinking of us.